Injury or loss of the meniscus generally leads to degenerative osteoarthritic changes in the knee joint. However, few surgical options exist for meniscal replacement. The goal of this study was to examine the ability of a non-degradable, anatomically shaped artificial meniscal implant, composed of Kevlar®-reinforced polycarbonate-urethane (PCU), to prevent progressive cartilage degeneration following complete meniscectomy. The artificial meniscus was implanted in the knees of mature female sheep following total medial meniscectomy, and the animals were killed at 3- and 6-months post-surgery. Macroscopic analysis and semi-quantitative histological analysis were performed on the cartilage of the operated knee and unoperated contralateral control joint. The PCU implants remained well secured throughout the experimental period and showed no signs of wear or changes in structural or material properties. Histological analysis showed relatively mild cartilage degeneration that was dominated by loss of proteoglycan content and cartilage structure. 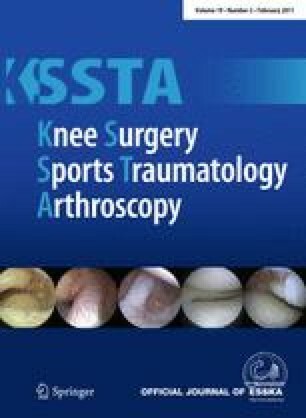 However, the total osteoarthritis score did not significantly differ between the control and operated knees, and there were no differences in the severity of degenerative changes between 3 and 6 months post-surgery. Current findings provide preliminary evidence for the ability of an artificial PCU meniscal implant to delay or prevent osteoarthritic changes in knee joint following complete medial meniscectomy. G. Zur and E. Linder-Ganz contributed equally to this work. We would like to thank Shannon O’Connor, Holly Leddy, and Bridgette Furman for their assistance with the histological analysis and grading. This work was supported by Active Implants Corporation.